George Geef (here introduced as G.G. Geef) has a gambling addiction, placing bets on anything and everything, and throwing money away on all manner of lottery. He loses his money on a slot machine, wins some in a back-alley craps game, loses big on a horse race, and finally walks off a big winner at a neighborhood poker game. Upon returning home, his wife immediately scolds him for gambling, until realizing he won, and George finds the one person he always has to settle up with is his wife. 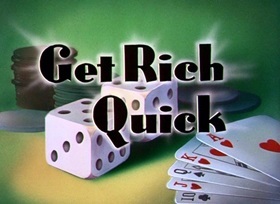 "Get Rich Quick" is another in the series of George Geef shorts from the 1950s that usually deal with some particular vice. We've already seen Goofy tackle food addiction, and now he takes on gambling. There are a lot more of these kind of shorts focusing on bad habits and societal good in the '50s and '60s. But what I like about a few of these Goofy ones is you can tell they were made for adults. It's easy to think of cartoons as "kid stuff", especially when they have social messages. But these are adults with adult problems and the folks behind these shorts are talking to them. This one deals with situations that are outside the view of most kids. There are some fun sight gags that play on literal interpretations of popular idioms. Goofy shorts are usually the place to find such gags. So when his money is "burning a hole in his pocket", it literally does. Or when a slot machine is referred to by it's slang term "one-armed bandit", the animation treats it like a hold-up, with Geef surprised by the lever in his back. I love when he leaves the poker game, which is surrounded by a cloud of smoke, and he just opens the smoke like a door. The alley craps sequence is a lot of fun. This was shortly before Guys and Dolls would bring the world of underground craps games to a new audience. The music that lures Geef into the alley is actually a re-use of a bossa nova element from The Three Caballeros. That's a nice little callback. I love that visual of dice as musical notes on the staff. What's the sound that lures him to the alley? The music of rattling dice. It's a very clever way to portray that, and something which Disney does well: blending sound and imagery. When Geef kisses his dice for luck, they kiss him back to signal lady luck is with him. And then there's that wonderful twist at the end. 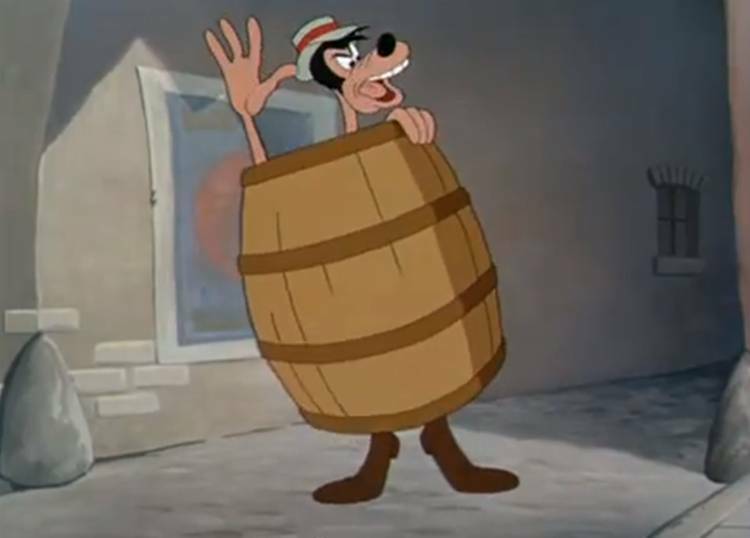 By this point, it had become a cartoon cliche that when a character loses his shirt he wears a barrel (you'll find it in several Donald Duck cartoons). But this one wonderfully turns that on its head when Goofy emerges with a barrel only to turn and you find out the barrel is full of money. He didn't lose, he won big! That's a wonderful twist on expectations. And in a way, doesn't that illustrate the thrill of gambling? Throughout the short, Geef has very few wins among his many losses. He wins the poker game with the most unlikely hand, a pair of deuces. The narrator calls him "lucky George Geef", but he sure hasn't seemed lucky during most of the cartoon. And it's these infrequent wins that lead to the addiction because suddenly the big win seems possible and all the losses worth it. And that's where the short ends. Geef sneaks home from the game and attacked by his wife for blowing their money on gambling... until she finds out he won. Then she changes her tune quickly! Something terrible seems less so when it benefits you. The wife now can take all his winnings for herself, and that's the joke of the ending "easy come, easy go". But isn't it interesting that she goes from violence to a tempered "oh how nice!" Let's take a moment to talk about Geef's wife. This is not her first appearance. I think she first appears in "Cold War", in which George Geef is sick at home with a cold. But she will continue to feature in other of the Geef shorts. She is always kept just offscreen, as a voice or a pair of hands or legs. We never see her face. They will eventually have a son, which we will discuss later. But her presence has led many to confuse the Geef character with Goofy himself. This is not Goofy's wife; it's George Geef's wife. And his son, though often later confused with Max from Goof Troop is a different character. It is unclear who Max's mother was or if Goofy is ever meant to have been married. "Get Rich Quick" isn't the strongest of the "social issue" shorts that Goofy tackles, but its gags are fun. And ultimately, it doesn't end with a didactic message. It simply sums up gambling as "easy come, easy go". It's more a way to gently poke at folks in the audience, but it doesn't end with a moral like telling Donald not to pay hooky from school or telling Pluto to save a kitty. Instead, it presents a social vice for laughs and leaves it the the audience to draw conclusions.